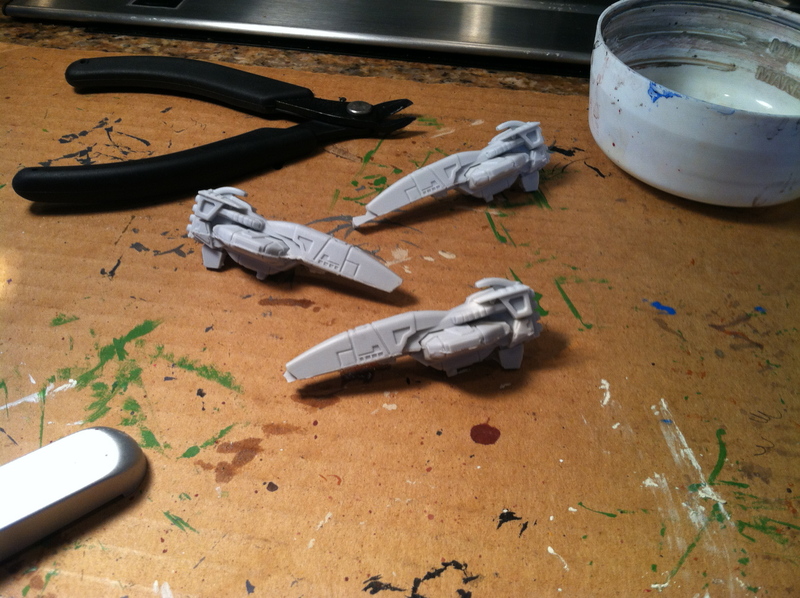 Those of you who’ve roamed the site know that I once posted a list of space stations available on Shapeways. 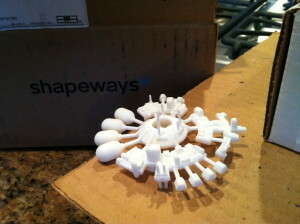 Shapeways, for those of you who don’t know, is a print-on-demand 3-d printing service. The ship above is the Belter Trading Station, by Irrational Designs, which showed up on my doorstep yesterday. Based on some input I got from the Impoverished Lackey, I decided to go with the “White, Strong, and Flexible; Polished” material to avoid some of the layering artifacts produced by the 3-d process. The result was pretty good, though I might have lost a touch of detail at the very edge of the model. The received model reminded me a great deal of the detail that you’d find on Brigade Models’ ships — good contours that require painting on windows and other such frills. The surface was a little gritty out of the package. I’m guessing that was leftovers from the polishing, because washing it with dish soap and cold water cleared that up (just like cleaning mold release from resin). Vel’Naveg missile cruiser, from Ravenstar Studios. The other toys on my workbench are the Vel’Naveg missile cruisers. They’re resin castings from Ravenstar Studios, and they aren’t nearly as screwed up as the original lead from Xtreme Hobbies. Pretty much all of the defects that plagued those miniatures are not present on these — though you have to do to clean them up. The halves of the mold appear to have leaked, and required attention to smooth the lines, and the overhangs on the aft quarter of the ship caught some extra resin that needed to be cleaned out. This entry was posted in third party and tagged cold navy, Shapeways, space stations. Bookmark the permalink. I can’t help you there. I am writing my own rules, after all.